Join Us!!! We are looking for someone to help us cover ABA women basketball. Please send us an e-mail. The The San Diego Surf opened their 2010-11 ABA season with an impressive, 140-123 win over the San Francisco Rumble Thursday night. The Rumble were ranked third in the ABA power rankings prior to the game. Leading the way in scoring for the Surf was Tim Denson (6'1''-G-86, college: Cal.St.-San Bernar.) with 43 points. Other impressive perfomances included Anthony Danridge (6'5''-G/F-86, college: N.Mexico), who had 33, Cornel Williams (6'4''-F-84, college: Long Beach St.) added 23 and Kalonji Kadima (6'3''-G-78, college: Wisc.-Stevens Point) had 17. San Francisco was led in scoring by DeVaughn Lamont (6'10''-F-84, agency: 011 Sports, college: Cal.St.-Monterey) with 35, Derek Foster (6'0''-G-81, college: Cal-Santa Cruz) had 24. San Diego had a slim, two-point lead at halftime and only a four-point lead at the end of the third quarter, but an aggressive defense and transition game allowed the Surf to open the game up and finish with a 17 point margin of victory. (story by Matt Potak) Another historic record setting season comes to an end with the Jacksonville Giants once again on top. 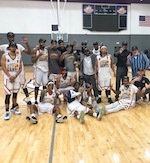 The Giants won their fourth straight ABA National Championship with a gutsy, 116-112, win over the South Florida Gold. Jacksonville is the only ABA team to win six total championships. Another record is winning four straight ABA championships. It's safe to say that Jacksonville is the American Basketball Association's Title Town USA. Jacksonville will now hang their 6th Championship banner up since 2010. "I'm proud of the team and entire Giants community," said head coach Jerry Williams . Williams has been with the Giants for all of the championship wins, three as head coach and the other three as an assistant coach. Even though the game took place in St. Louis, the Northeast Florida fan base stayed up to date with the contest on social media. Multiple media correspondents and fans continued to praise the Giants before and after the game. The strong support was noted by the team and helped fuel them to another championship win. The entire community stayed informed and positive throughout the ABA Tournament series. Twitter posts and retweets were flowing all Saturday night and into the early morning hours of Sunday. "Can anyone beat the Giants?" Despite the win, Jacksonville actually trailed the Gold early in the game. However, a strong second half propelled the team to another win. Maurice Mickens (6'0''-G-86, college: LeMoyne-Owen) got the momentum going scoring 13 second quarter points. Bernard Nugent (6'0''-PG-91, college: Clayton St.) also contributed scoring a total of 23 points in the game. The top notch shooting paved the way to another thrilling win. 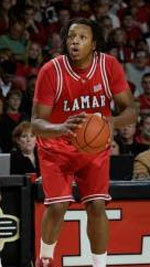 Calvin Warner (6'7''-F-80, college: Jacksonville) also added 18 points to round out the scoring leaders. South Florida made a late comeback push, but The Giants were able to use a powerful defense to maintain the lead. Warner and Jerrod Tucker (6'4''-F-86, college: Bellevue) played explosive defense on the inside with Mickens and Nugent containing the outside shooting game. Jermaine Bell (7'0''-C-84, college: Indian Hills CC) and Aaron Bowen (6'6''-F-91, college: Georgetown) helped tremendously in the rebounding department to maintain Giant possessions. Overall it was an absolute team effort and exciting way to finish the season. The team played all year with courage and heart. Another history making season comes to an end with your Jacksonville Giants at the top of the standings for the fourth straight season. Three-time defending champion Jacksonville Giants have earned another trip to the ABA Final. The Giants took care of business against the third ranked Syracuse Stallions in the semifinals with a 149-129 victory on Friday to reach the title game. The five-time champion will have a familiar opponent on Saturday when they face South Florida Gold, a Southeast Region rival based in Lake Worth. Gold needed a comeback in their semifinal to down the Richmond Elite 131-122. The two finalist met on March 9 in the regional final with South Florida winning 139-134. Gold finished atop the ABA Power Rankings with an undefeated season. The Giants were fourth in the rankings.